You say you don't have ANY room for a garden — not a even a tiny piece of earth? 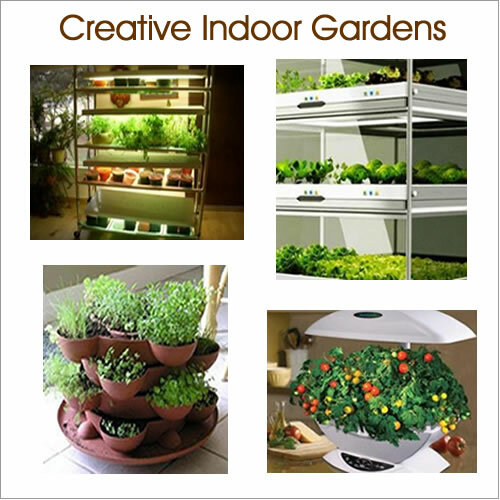 Indoor vegetable gardening may just what you need. As you learn to grow vegetables or fruits indoors, you will be preparing yourself for a time when you need the food or when you have more land and can expand your knowledge. Any vegetable that does not need to be pollinated in order to produce will work such as lettuce (all kinds), greens (all kinds), broccoli, radishes, baby carrots, herbs, onions — and the list goes on and on. Most vegetables that are considered cool-weather crops will work. The list may seem long, but it is by no means complete. There are others that will grow well and some crops will grow better than others. Cool weather crops will do best. Tomatoes can be grown but will produce more fruit with grow lights. Dwarf fruit trees can be grown indoors, but you must have patience to wait for them to fruit. They are not fast growers like vegetables. Herbs grow well in your kitchen window. Sprouts are tasty, condensed nutrition, and easy to grow. All you need is a bottle, some seeds to sprout, and a mesh fabric and an elastic band to put over the top. As an indoor farmer, you can plant and harvest crops of vegetables, though probably not "crops" with the traditional meaning. But you can have a harvest of vegetables sufficient to make a difference in your diet, your grocery bill, and your health, but don't count on having all that you need or enough to supply the neighbors. When the choice is "some" or "none," some can seem like a lot. For example, half-a-dozen containers in a sunny window consisting of greens or lettuce at peak production would supply a family of four a small green salad each probably twice a week. You could probably harvest some lettuce greens for sandwiches every day or some spinach to cook for dinner once a week. How large your harvest is will be determined by you. How large an indoor vegetable garden are you willing to work with? How many are in your household? How much space are you willing to find, give up or create for garden greens? One of the most exciting things that I have discovered is that you can have fresh veggies year round. 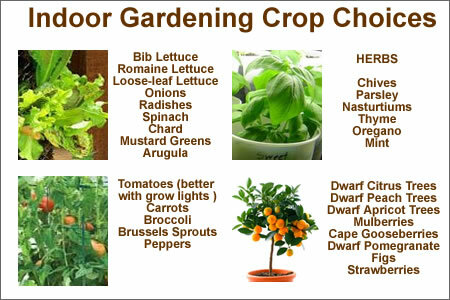 The key is understanding what you can and can't grow indoors and be willing to try different seeds and methods. One of the things you will need to have on hand will be a batch of fresh seeds. Your success could well hinge on the age of the seed. The older the seed, the less the sprouting capability of that seed. Heat will cause seeds to deteriorate also. One good thing is that seeds will remain viable for a year of two if you keep them in a very cool place, like your refrigerator. Put your seed packets in a resealable storage bag, squeeze out all the extra air, and keep them in the fridge. When you need to take some out, only take out the packet you need and only keep it out for exactly as long as you have to. If not fresh and if not kept very cool, don't expect all the seeds to germinate the following year. Some may, but do you really want to take that chance? For long term storage, it's best to buy seeds that are non-hybrid, non-GMO, open pollinated seeds, which means the harvested seeds may be planted year after year. Hybrid seeds are one-time use only. Growing vegetables in pots or boxes in sunny places or artificial light can only be limited by your enthusiasm and patience. Any out-of-the-way place with sunshine will work for indoor vegetable gardening. Window sills are a good choice. You can buy decorative containers only four inches wide or so, designed especially for window sills. Hanging baskets, shelves, tabletops, bookcases, anywhere you would put a houseplant, you can put a small garden. If you don't have enough natural sunlight, install a grow light or fluorescent light to help nature along. In cold climates, you may have to insulate the containers, windowsills, window gardens, or greenhouse windows. A piece of cardboard across the base of the windows, some cloth, or styrofoam could keep out enough of the cold to protect your plants. Or wrap your container in a folded newspaper "blanket" or bubble wrap and hold in place with a rubber band. In terribly hot climates, you may have to figure out how to insulate for just the opposite reason. The sun blazing through a glass window can be more intense than direct sun, like the sunshine intensified by a magnifying glass, which will cook your plants. A gauzy curtain or waxed paper taped in the windows can protect your plants from those intensified rays. It's important for indoor vegetable gardening to have rich soil. You can buy good potting soil at most supermarkets, discount department stores, or hardware stores. You can use it as is, or for an additional boost for your plants, go to a pet shop and buy a box of fine sharp sand mixed with ground oyster shells generally used in birdcages. Mix some of it into your potting soil — the sand lightens the soil, and the oyster shells provide lime. These two ingredients are beneficial for your soil and plants. Just because your indoor farm is a lot smaller than a typical backyard garden plot, don't imagine it is completely care-free. It must be watered and fed too. And just because they are growing in your house does not make them houseplants. Vegetable plants need vegetable food. Full-strength vegetable fertilizer like you would use in an outdoor garden is too strong for a container plant. Dilute it to about half the strength recommended on the container. Use this weaker solution every week. Too much water is a real problem with container plants. More houseplants die from overwatering than underwatering. But not enough water means death to the plant also. Unfortunately there is no hard and fast rule about watering. It depends on what type of containers you have, how big they are, where they are located, the temperature, the humidity, the type of plant, and on and on. Unlike houseplants, a vegetable plant should never droop from lack of water; that's a sign the plant is in stress and it greatly slows down its production. A general rule: if the top inch of soil is dry, it's time to water again. Icy-cold water in the middle of winter can cause shock in plants. Use luke warm water instead. In some climates, a little humidity helps. An easy way to create humidity is to fill a tray or dish an inch deep with pebbles or gravel, fill with water and place your plant container on top of the pebbles. If you're not ready to take on indoor vegetable gardening or any kind of gardening, be prepared and buy long term storage seeds, stash a few bags of potting soil and some containers — you know — just in case you HAVE to grow your own food. Just remember, in a real crisis, seeds may not be available at ANY PRICE. Think of it as insurance. Growing Sprouts - Easy, inexpensive, delicious!